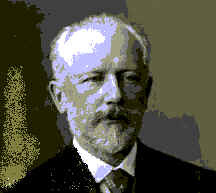 Tchaikovsky, Peter Ilich, (1840-1893), Russian composer, among the foremost of the 19th century. Tchaikovsky was born May 7, 1840, in Votkinsk, in the western Ural area of the country. He studied law in St Petersburg and took music classes at the St Petersburg Conservatory. There his teachers included the Russian composer and pianist Anton Rubinstein, from whom Tchaikovsky subsequently took advanced instruction in orchestration. In 1866 the composer-pianist Nicholas Rubinstein, Anton's brother, obtained for Tchaikovsky the post of teacher of harmony at the Moscow Conservatory. There the young composer met the dramatist Aleksandr Nikolayevich Ostrovsky, who wrote the libretto for Tchaikovsky's first opera, The Voyevoda (1868). From this period also date his operas Undine (1869) and The Oprichnik (1872); the Piano Concerto No. 1 in B-flat Minor (1875); the symphonies No. 1 (called Winter Dreams, 1868), No. 2 (1873; subsequently revised and titled Little Russian), and No. 3 (the Polish, 1875); and the overture Romeo and Juliet (1870; revised in 1870 and 1880). The piano concerto was dedicated originally to Nicholas Rubinstein, who pronounced it unplayable. Deeply injured, Tchaikovsky made extensive alterations in the work and reinscribed it to the German pianist Hans von B�low, who rewarded the courtesy by performing the concerto on the occasion of his first concert tour of the United States (1875-1876). Rubinstein later acknowledged the merit of the revised composition and made it a part of his own repertoire. Well known for its dramatic first movement and skilful use of folk-like melodies, it subsequently became one of the most frequently played of all piano concertos. In 1876 Tchaikovsky became acquainted with Madam Nadezhda von Meck, a wealthy widow, whose enthusiasm for the composer's music led her to give him an annual allowance that enabled him to spend all his time on composition. Fourteen years later, however, Madame von Meck, believing herself financially ruined, abruptly terminated the subsidy. Although Tchaikovsky's other sources of income were by then adequate to sustain him, he was wounded by the sudden defection of his patron without apparent cause, and he never forgave her. The period of his connection with Madame von Meck was one of rich productivity for Tchaikovsky. To this time belong the operas Eugene Onegin (1878), The Maid of Orleans (1879), Mazeppa (1883), and The Sorceress (1887); the ballets Swan Lake (1876) and The Sleeping Beauty (1889); the Rococo Variations for Cello and Orchestra (1876) and the Violin Concerto in D Major (1878); the orchestral works Marche Slave (1876), Francesca da Rimini (1876), Symphony No. 4 in F Minor (1877), the overture The Year 1812 (1880), Capriccio Italien (1880), Serenade for string orchestra (1880), Manfred symphony (1885), Symphony No. 5 in E Minor (1888), the fantasy overture Hamlet (1885); and numerous songs. Meanwhile, in 1877, Tchaikovsky, hoping to still the conflicts he felt about his homosexuality, had married Antonina Milyukova, a music student at the Moscow Conservatory who had written to the composer declaring her love for him. The marriage was unhappy from the outset, and the couple soon separated. From 1887 to 1891 Tchaikovsky made several highly successful concert tours, conducting his own works before large, enthusiastic audiences in the major cities of Europe and the United States. He composed one of his finest operas, The Queen of Spades, in 1890. Early in 1893 the composer began work on his Symphony No. 6 in B Minor, subsequently titled Path�tique by his brother Modeste. The first performance of the work, given at St Petersburg on October 28, 1893, under the composer's direction, was indifferently received. Nine days later, November 6, Tchaikovsky diedof cholera, according to official records. More recently, however, it has been suggested by scholars that he committed suicide at the behest of a court of honour which had found him guilty of a relationship with a male member of the imperial family. Many Tchaikovsky compositionsamong them The Nutcracker (ballet and suite, 1891-1892), the Piano Concerto No. 2 in G Major (1880), the String Quartet No. 3 in E-flat Minor (1876), and the Trio in A Minor for Violin, Cello, and Piano (1882)have remained popular with concertgoers. His most popular works are characterised by richly melodic passages in which sections suggestive of profound melancholy frequently alternate with dance-like movements derived from folk music. Like his contemporary, the Russian composer Nikolay Rimsky-Korsakov, Tchaikovsky was an exceptionally gifted orchestrator; his ballet scores in particular contain many striking effects of orchestral coloration. His symphonic works, popular for their melodic content, are also strong (and often unappreciated) in their abstract thematic development. In his best operas, such as Eugene Onegin and The Queen of Spades, he used highly suggestive melodic passages to depict a dramatic situation concisely and with poignant effect. His ballets, notably Swan Lake and The Sleeping Beauty, have never been surpassed for their melodic intensity and instrumental brilliance. Composed in close collaboration with the choreographer Marius Petipa, they represent virtually the first use of serious dramatic music for the dance since the operatic ballet of the German composer Christoph Willibald Gluck. Tchaikovsky also extended the range of the symphonic poem, and his works in this genre, including the Romeo and Juliet overture and Hamlet, are notable for their richly melodic evocation of the moods of the literary works on which they are based.